When particle counters are manufactured, they are tested, calibrated and then capped (see black cap in the above image) to prevent contamination getting into the particle counter during transport and or via other means. Capping your particle counters during transport and or when not in use has always been good industry standard practice. 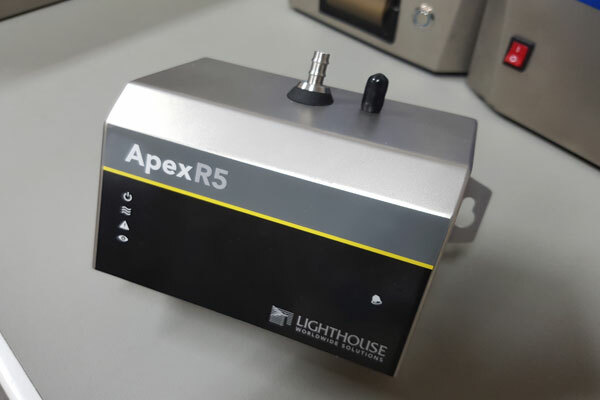 That said, this doesn’t always happen and LAF Technologies often receives instruments from client sites where they have simply placed the instrument into a box (sometimes, not even properly packed) with no cap on the top to prevent dust and other material entering the inlet. In such cases, the instrument often not only requires calibration, it may require internal cleaning to remove debris that has made its way down, or lodged in the inlet. This takes more time and can lead to increased costs. If any organizations are missing their caps and or need additional caps, please feel free to contact LAF Technologies. The other thing we see from time to time (not all the time) and this has been an age old problem in industry for decades, is particle instruments that come back full of gunk. Gunk meaning liquid, cleaning solution and or other material. The most common cause of this, is where a customer has not capped their particle counter and or not turned off their vacuum pump during a cleaning or decontamination process and cleaning solution has been drawn into the particle counter. Some customers have even admitted to spraying cleaning solution down the particle counter orifice to “give it a good clean out”. This is not a good idea obviously with ANY particle instrument and it can lead to contamination and potentially instrument damage. At the end of the day, accidents do happen, pharmaceutical processes malfunction at times and it’s not impossible for liquid to be drawn into a particle counter. With education and careful planning however, these risks can be reduced and facilities can expect to enjoy many happy years of service from their particle instruments.